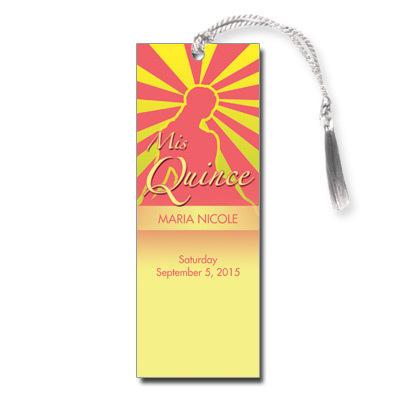 Give away a bright, modern keepsake for your daughter's Quinceanera with this pink, green and yellow bookmark. A silhouette of a girl in a ball gown is highlighted by a starburst pattern behind her. Your personalized event information is printed in front. Bookmark measures 2x5.5 and comes with white tassels; light assembly required.